Only known full biography of Leland Hayward (1902-71) available on the internet. Leland Hayward was a play and actors agent. He features prominently in the careers of Henry Fonda, Katherine Hepburn, Jimmy Stewart, Joshua Logan and Margaret Sullavan at least. Leland Hayward was a play and actors agent, and play and movie producer. He features prominently in the careers of Henry Fonda, Katherine Hepburn, and Margaret Sullavan at least. See also Dorothy Dudley of whom I'd never heard until she popped up in a search on Leland! ''Fonda: My Life: as told to Howard Teichmann'', by Henry Fonda with Howard Teichman. New American Library. 1981 referred to below as "Fonda: My Life"
"Me : Stories of My Life" , by Katharine Hepburn. Ballantine Books, 1996 referred to below as "Me"
"Kate: The Woman Who Was Hepburn" by William J. Mann, 2006 referred to below as "Kate"
"Josh, My Up and Down, in and Out Life", by Joshua Logan, Delacorte Pr 1976 referred to below as "Josh"
Leland Hayward was born 13 Sep 1902 in Nebraska City, Nebraska, the only child of lawyer William Hayward and his wife Sarah Coe Ireland. His grandfather had been briefly, a U.S. Senator from Nebraska but died in 1899. Brooke Hayward relates how just after William and Sarah were married "he brought home the first car in Nebraska City". ("Haywire", p100) William Hayward became a county judge in Nebraska in 1901. He ran for State Congress in 1910. Just after this, they moved to New York City, but Sarah moved in 1911, back to Omaha and divorced William. In 1922 when Leland applied for a passport, he stated that from Dec 1910 to Sep 1911 he lived in China! That's a very odd response. Was he with his mother or father ? After the divorce, Sarah then married on 20 Oct 1913 to Sheppard G Schermerhorn, the vice-president of the United Fruit Company and lived at 375 Park Avenue back in New York City. (A rather tony address!) William became a U.S. Attorney, and married in 1919 to Sarah "Maisie" Manwaring Plant, a wealthy widow. Her stone house took up the entire block of 86th and Fifth Avenue. Leland's step-brother Philip Plant eloped in 1925 to France with the actress Constance Bennett, they divorced in 1929 but Constance showed up with a boy she claimed was Philip's heir. A lengthy court battle ensued. Leland went to school at St Paul's, then Hotchkiss and eventually Princeton, which he apparently left without a degree. His first job was reporting for the old New York 'Sun' newspaper. Leland Hayward's first wife was Miss Inez Gibbs. She is also called "Lola" Gibbs so perhaps this was a middle name. William Leland Hayward, 19-year-old son of Colonel William Hayward, and Miss Inez Gibbs, 18-year-old daughter of Mr and Mrs George Wilde Gibbs of 940 Park Avenue, were secretly married last Monday, it was learned yesterday. The young couple left New York without warning and motored to Greenwich, Conn., where they were married by a Justice of the Peace about 6 o'clock in the evening. Young Hayward had been attentive to Miss Gibbs for more than a year, and recently they had talked of getting married. The bride's family objected on account of their youth, but when a telegram came announcing the wedding and asking forgiveness it was readily granted. In the telegram the young couple also stated that they were going to Europe for their honeymoon, but at present they are staying at the Plaza. Mr and Mrs Gibbs are planning to go to Europe themselves in June, and the supposition now is that the young people will wait and accompany them. Miss Gibbs is a granddaughter of former Governor Barnett Gibbs of Texas. Mr Hayward is the son of the famous commander of the colored Fifteenth Regiment of New York's National Guard, which won the title of the "Black Tigers" by its deeds of valor during the war. Colonel Hayward and his present wife, who before their marriage in June, 1919, was Mrs Sarah Plant, the wealthy widow of Morton F Plant, are now in Paris, and their home at 1051 Fifth Avenue is closed." In Jun 1922, Leland applies for a passport to go to France. At that time, he states that he is living at 59 West 46th Street and working in advertising. Leland and Inez divorced in May 1924 in Paris, she returned to the U.S. where in Jan 1925 she married next to Frederick Clark Sayles Jr. The reason for their initial divorce is not mentioned but, perhaps the divorce was somehow tied to his apparently notorious womanizing as Hepburn author Barbara Leaming states it. Although the picture she draws of a man addicted to fancy clothes and owning 'more than three hundred pairs of tiny shoes' sure seems a bit odd to me. Does she mean that he had small feet? Or that he collected miniature shoes? Leland's daughter Brooke wrote a book about their dysfunctional family called "Haywire". Leland next went into publicity for United Artists. In 1927, Leland with Forrest Halsey, co-wrote a script called "The Whip Woman", Estelle Taylor was to play the lead, and the film was to be produced by Robert Kane of First National pictures. It was released in 1928 and described as a picture about a "madcap Hungarian girl who uses a whip on her admirers." Leland and Inez remarried in Feb 1930 in Dallas, Texas. The remarriage took place at the home of her parents who split time between Dallas and New York City. She had divorced Sayles Jan 1928 in Reno, Nevada. Sometime between 1922 and 1932, Leland apparently formed the "American Play Company" although perhaps he formed this only jsut after becoming Kate's agent. As you'll see in a moment RKO asked "Leland's New York Office" to inquire about Kate, which implies he had an office! But an office of what? for whom? We don't yet know with any clear citation. Katharine Hepburn had finally made a name for herself, after much failure, as the star of the 1932 Broadway play "The Warrior's Husband" which played at the Morosco Theater closing in May. RKO had asked Leland's New York office to inquire after her, and so Miriam Howell who was working as an agent for Leland's "American Play Company" came to see her. Kate did a screen test playing opposite her friend Alan Campbell, who was later married to Dorothy Parker. ("Me", p121) George Cukor liked what he saw and so Kate was asked to come to Hollywood. She took a train in July 1932 accompanied by her close friend (some say lover) the wealthy heiress Laura Harding "the first real friend I had in New York". Laura was the daughter of financier J Horace Harding. Mann implies that it was Laura who introduced Kate to Leland ("Kate", p159), however without seeing the obvious nature of it, relates how Kate's "aunt" Mary Towle was raised to the position of assistant U.S. Attorney by Leland's father. While Mann has Leland "banging on her dressing room door" during the run of "The Warrior's Husband", Leaming has them not meeting until she arrived in Hollywood, although Kate then seeing Leland there recognizes him which makes no sense to me. In addition, Kate herself relates the story of how Laura was surprised to see Leland waiting on the platform when they got to Pasadena, but that Laura recognized him from her own debutante days in New York City. All the stories are confused and lack the air of authenticity however, so we'll simply have to wonder who is glossing and who is fibbing. Mann states that Leland was partners in the representation of Kate with Myron Selznick, brother of David who was then the head of RKO. One thing however was clear, Leland had pushed very hard to get Kate a whopping $1500 a week for her stay in movie land, an unheard-of sum for a film virgin. ("Kate", p169) Kate's film debut was under George Cukor's direction in "A Bill of Divorcement", as the daughter of John Barrymore and Billie Burke's characters. Her companion, Laura Harding who had had theatrical ambitions of her own, would also appear in a bit part in that film. In Barbara Leaming's biography "Katharine Hepburn", she reports that at first David Selznick was not impressed with Kate's scenes, but he had to sit up when the movie critics began heaping praise on her performance and the audiences stirred with excitement. This was Billie Burke's return to film after many years off, as she was busy trying to pay off her husband Ziegfeld's debts caused or exacerbated by the Great Depression. See more on her at my article "Biography of Billie Burke", Knol. Kate next went on to be in RKO's "Morning Glory", released August 1933 starring opposite Douglas Fairbanks Jr and Adolphe Menjou, for which she won an Oscar. However Fonda or his writer are mistaken as to when Leland began his agency. New York Times reports in Aug 1932 the incorporation of "Leland Hayward, theatrical business - W Hayward 451 Fifth Avenue". The timing of this, just after he had brought Kate to Hollywood I'm sure is not a coincidence. This could possibly mean that it was Kate who was actually his very first client. A month later, in Sep 1932 the New York Times is reporting the incorporation of "Leland Hayward - James R Cowan, printing, theatrical business - W Hayward 551 5th Avenue" And in December 1932 we get the announcement of a business lease by "Leland Hayward publisher at 654 Madison Avenue". Perhaps one or more of these was related to the "American Play Company". Leland had left the American Play Company by Jul 1933, but I'm not how much earlier. This can be known because in the suit of Zita Johann settled that month out-of-court, it is mentioned that he had already left the company. Perhaps this was the time, he went to Hollywood, one step in front of Kate and stayed for a while there. 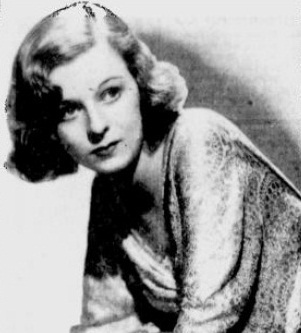 Mann states that when Kate won her first Oscar for "Morning Glory", since she had not attended the ceremony, it was Leland who called her on 17 Mar 1934 to tell her. ("Kate", p1) In Apr 1934 we get "Leland Hayward artists' representative at 654 Madison Avenue" later that year he is mentioned in 1 May as the "theatrical representative" of Katharine Hepburn who was "then under contract to RKO" at the time she had gone to Mexico to get her quickie divorce from Ludlow Ogden Smith. Kate returned to her New York City home from her Yucatan vacation, with her companion Laura Harding. The next day 2 May 1934 in a brief interview, Kate declares a second marriage "furthest thing from my mind right now.... Mr Hayward is my manager. He's on the West Coast now." But a few days later the above picture was snapped as he was changing planes in Chicago on his way en route to New York City. On 27 May 1934, they are both in Hollywood where a newspaper account mentions them dining together at the "Beverly Derby". A week later a brief mention of Leland calls him a "wealthy resident of Los Angeles." Now Henry Fonda was going to enter the movies. At this time "Leland Hayward, who was on the brink of becoming the top talent agent in the country, signed him up and convinced a reluctant Fonda to go to Hollywood for $1,000 a week." (''My Life So Far'', p 37). On 14 Aug 1934, newspaper columnist Louella Parsons is reporting that Henry was then on the Universal lot and had "signed with Walter Wagner [sic], to play an important part in ''The President Vanishes''" (''The Fresno Bee Republican'', 14 Aug 1934, page 4). Leland became involved in a romantic liaison with Katherine Hepburn (or so she claimed after he had already died). Mann, Katherine's latest biographer thinks it was not a physical situation at all, just that Kate drummed it up a lot. Leaming says they slept in the same bed, Mann says he slept in the living room and it was Kate and Laura who were sleeping together. In a 3 Dec 1934 United Press article, dated from Hartford, Connecticut, Kate is quoted "I wouldn't say anything about it", her rumoured engagement to Leland, "even if it were true, or even if I were married to him." The articles goes on to state that she "expects to return to the West Coast, the first of the year to make a new picture." On 1 Jan 1935, we get " Katharine Hepburn visiting family here [Hartford] curtly denied engagement to Leland Hayward her agent." On 12 Mar 1935, Mollie Merrick is reporting from Hollywood that "Hollywood Gossips are off the Katharine Hepburn - Leland Hayward story now, although a few months ago they swore the two were married in Mexico. It's a brand-new chap these days, they say, but for reasons of church and state, no names mentioned." On 30 Jun 1935, Paul Harrison, reporting from New York gives us "Loretta Young and Leland Hayward are making a lisson two-some..." In Aug 1935, Leland is mentioned as participating in a contest to fly from Los Angeles to Cleveland sponsored by Ruth Chatterton the actress. Also that same month it's being reported that "Katharine Hepburn's heart interest is Leland Hayward, an artist's agent, and they also have been secretly married." In Oct 1935 the "Leland Hayward office" is mentioned in connection with two plays to be produced. On 7 Nov 1935, a United Press article dated Newark, New Jersey, "Escapes Death And Cameramen, by Close Margin" : "Katharine Hepburn, film actress, escaped death by inches on her arrival from California today, when she ran under whirling propellers of a transport plane to elude photographers.... Leland Hayward, a friend who traveled with Miss Hepburn, said she ran from photographers to win a bet made in Hollywood that she would not be photographed on her trip East. She avoided cameramen in all other spots, Hayward said." On the same trip, dated earlier that flight, at St Louis "Katharine Hepburn, screen star, was believed to be en route to New York today in a plane piloted by Leland Hayward, her manager and perhaps her husband." Mechanics at Lambert field quoted him as saying "I'm not a celebrity but only her husband." But later that same trip at Pittsburgh, Leland is quoted as saying that the rumors that they are married are "bunk". On 6 Dec 1935 "Star's Father Operates on Her Manager", "Hartford - Leland Hayward, sportsman pilot and business manager for Katharine Hepburn, stage and screen star, was operated on by her father, Dr. Thomas N. Hepburn, several days ago, it was learned. Hayward, who has often been reported to be Miss Hepburn's husband, and has denied it, just as often, has been receiving daily visits from the actress as he convalesces at Hartford Hospital. Although hospital authorities and members of the Hepburn family refused all information, it was learned Hayward entered the hospital late last week and had dined with Miss Hepburn at least twice since then." On 17 Jan 1936, it's mentioned that he is the agent of the then-unknown Doris Dudley who was on her way to Hollywood to appear in her debut film role. In Apr 1936 then being called "manager of Kathryn Hepburn" he crashed his plane at Roosevelt Field but was only cut on his hands. In Apr 1936 it was announced that he was teaming up with Charles MacArthur and Ben Hecht to produce a new play by them. In 1936 when Helen and Nolan Leary dramatized Josephine Lawrence's novel "Years Are So Long" it was Leland Hayward, Inc which negotiated the sale of that to Paramount. On 10 Apr 1936, Louis Sobol reporting from Hollywood that "...again, Leland Hayward makes an appearance with Ginger Rogers...."
"Movie audiences having indicated that they aren't interested in brains, alleged and admitted madmen Ben Hecht and Charles MacArthur have turned from their unsuccesful film producing venture to legitimate play producing. The first offering of the new firm is to be a play, unidentified, from their own facile pens. Thereafter they will seek other news plays for presentation, and even finance other producers. Colleague in the venture is play reader and caster Leland Hayward." "just sold him to Wanger" for "History is Made at Night". When Josh again met Boyer the star, Boyer told him that "I told Wanger if he didn't get you I wouldn't make the picture". So there you go. Leland the deal maker. 11 Jun 1936 - "Accompanied by Leland Hayward her manager, La Hepburn speeded to a sneak preview in Santa Barbara to see 'Mary of Scotland' which she had finished the other day at RKO. But some fans recognized her, so she fled the theater to sit in the car during the showing. Leland Hayward, hopped back and forth every five minutes reporting audience reaction to the picture." 17 Jun 1936, Louella Parsons reporting "Ginger Rogers, dining tete-a-tete with Leland Hayward, Katie Hepburn's boy friend, but it was all in the interests of big business -- he's her agent." 15 Jul 1936 "Margaret Sullavan, Herman Mankiewicz and Leland Hayward at the Brown Derby." 9 Aug 1936 "Very coy about posing, screen star Margaret Sullavan, and Leland Hayward, business manager and some say, husband of Katharine Hepburn, are picture at the Hollywood Bowl during a Lily Pons concert.... Their appearance together provides new fodder for filmdom gossip-guns, since Margaret has since her divorce several months ago from director William Wyler, favored in turn her first husband, Henry Fonda -- and then popped right back into the Hollywood spotlight with Wyler again." In Aug 1936 being called "Leland Hayward of New York City" he again enters the pilot contest to fly from Los Angeles to Cleveland. Also that month Howard Lindsay complains that Leland had sold him ten years ago "down the river to Metro for a five-year stretch..." I believe he means that Leland negotiated a contract for him at Metro. If accurate and not said in jest, that would predate any other negotiating experience so far revealed by Leland. Leland served as an usher at Henry Fonda's next marriage on 16 Sep 1936 in New York City to socialite Mrs Frances (Seymour) Brokaw whose last husband had left her a cool million. "Margaret Sullavan, five foot two actress, was a bride today -- but she wasn't letting a honeymoon interfere with her current stage appearance. "Miss Sullavan and Leland Hayward, dynamic theatrical agent, hurried back to New York from Newport, R.I., where they married Sunday so she could continue her steller role in 'Stage Door,' a George S Kaufman - Edna Ferber play concerning the life of girls trying to make good in show business. "In the play, incidentally, Miss Sullavan weds a screen scout. "The wedding, which took place in a Methodist Episcopal Church parsonage, surprised many of the couple's friends. Hayward's father, Colonel William Hayward, former United States attorney, was a witness. "She is the former wife of Henry Fonda, actor who recently married a socially prominent widow, Mrs. George T Brokaw, and of William Wyler, Hollywood director. "Hayward's name frequently had been mentioned romatically with that of Actress Katharine Hepburn, for whom he is business manager. He eloped in 1924 with Lola Gibbs, Park Avenue debutante, while he was a student at Princeton. Divorced, they remarried in 1930, but parted again four years later. He is thirty-four." 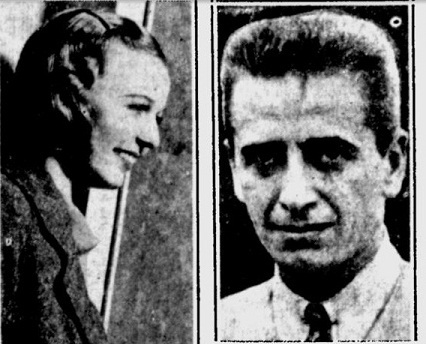 Leland not one to sit around, a few days later on 18 Nov is found accompanying Lily Pons and Andre Kostelanetz on their airplane trip from Los Angeles to Newark where they announced they would soon be married. Hollywood - The long-standing feud between Margaret Sullavan and Katherine Hepburn has just received another stimulant. You know, for a long time the brilliant young actor's agent, Leland Hayward, and Hepburn were so close that Hollywood thought they were married. Then all of a sudden several days stage of a certain New York stage Hayward married Sullavan, stage success, "Stage Door." RKO has just purchased "Stage Door" for production in a month or so. And the movie luminary who takes Sullavan's part in the play is none other than Hepburn." 18 Mar 1937 "The Drama Desk" by Harold W Cohen, "Local Scrappings"
"Laura Harding, for many years Katharine Hepburn's constant companion but now with the Leland Hayward theatrical agency in New York, flew in from the east the other day in to spend a short time with the 'Jane Eyre' star." Leland and Margaret had three children : Brooke (b. 1937) who was briefly an actress, and was married in 1961 to actor Dennis Hopper, Bridget (b. 1939), and William (b. 1941). Leland and Margaret divorced Apr 1948 in Los Angeles court, she later committed suicide by an overdose of barbiturates in New Haven, Connecticut on 1 Jan 1960. Her daughter Bridget Hayward committed suicide ten months later. 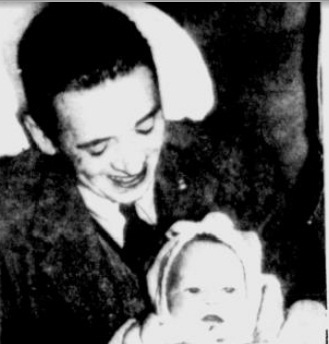 The New York times reports on 6 Jul 1937 "Los Angeles, July 5 - Margaret Sullavan, stage and screen actress, who is the wife of Leland Hayward, movie agent, yesterday gave birth to a daughter, her first child, at the Cedars of Lebanon Hospital. She retired from the cast of 'Stage Door' while playing in New York last April. " A few days later on 15 Jul 1937 "Leland Hayward, the agent, is understood to be opening an office of his own in Hollywood, where he now is ..." Henry Fonda and Frances Seymour were the parents of actors Jane Fonda (b. 21 Dec 1937) and Peter Fonda (b. 23 Feb 1940). 28 Aug 1937 - "Jimmy Stewart is a godfather, the baby being tiny Brooke Hayward. But he is the third one, the other two being John Swope and Josh Logan." 2 Apr 1938 - Hedda Hopper's Hollywood - "Margaret Sullavan and Hubby Leland Hayward left early It was moving day for them into a rambling house they've remodeled in Brentwood." "Miss Sullavan hasn't been seen on the screen for about two years, and there are many of us who have missed her, for she is an actress of rare abilities and of rich experience, considering her relatively tender years. In the interim Miss Sullavan appeared in several productions on Broadway, notably 'Stage Door.' There was also the matter of presenting her husband, Leland Hayward, theatrical agent, with a baby girl. This event, considered anything but blessed, by the management, forced her to step out of the role as the stage-struck girl. Her first film since her return to Hollywood, 'Three Comrades,' comes Friday to Loew's Penn, with Robert Taylor, Robert Young and Franchot Tone in the title roles of the film, based on Erich Remarque's story of post-war, but pre-Nazi, Germany." In Jan 1939, Leland was named to the board of TWA Transcontinental and Western Air, Inc. stating that he has "extensive motion-picture and private aviation interests." On 10 Feb 1939 their daughter Bridget was born in Hollywood. 21 May 1940, New York Times, pg 33 "In a message yesterday from Beverly Hills, Calif., Fred Astaire said that he had no stage plans for this Fall. His agent, Leland Hayward, added that Mr Astaire probably would be kept in Hollywood by film assignments." In Jan 1941, he is mentioned as one of the 21 backers of the play "Arsenic and Old Lace", which was playing at the Fulton Theater. On 27 Mar 1941 their son William Hayward was born in Los Angeles. On 6 Dec 1941 "Greta Garbo has engaged Leland Hayward as her agent. The actress never before has employed a representative, always negotiating her agreements personally with Metro-Goldwyn-Mayer. She has been without a term contractual commitment since 1932, and has made only two pictures in the last four years." On 5 Apr 1942, "Ted Allan who can be reached through his agent Leland Hayward Inc, 654 Madison Avenue, New York City, is writing a biography of Dr Norman Bethune...." On 5 Jun 1942, "Leland Hayward Inc, agent for actors, writers and entertainers, has leased the twenty-sixth floor in 444 Madison Avenue." The Hayward family appears with different levels of detail in the biographies written by Kate, Hank, and Peter and Jane Fonda as well. Leland and his family lived for some years near the Fondas in California. It was Leland as Fonda's agent who set him up to play Tom Joad in 1940's "The Grapes of Wrath", perhaps his best-known role. Brooke in discussing the Hayward and Fonda families states "We had all grown up half a block away from each other in Brentwood, and had simultaneously moved away, we to our farmhouse in Connecticut and the Fondas to an enormous piece of property up on Tigertail Road." ("Haywire", p141) Brooke mentions that they lived at 12928 Evanston Street ("Haywire", p72) and I find them listed there in the 1942 Voter's Registration file. Brooke helpfully states that they lived at that address "for the first seven years of my life." So they must have moved in 1944 or 1945. Also down the road lived "resolute bachelors" Jimmy Stewart and Johnny Swope in a house they shared together, for many years. John Swope eventually married Henry Fonda's friend and fellow actress Dorothy McGuire in 1943, Stewart married Gloria Hatrick in 1949. Makes ya think don't it? When John Swope got married 18 Jul 1943, it was at the home of Leland and Margaret in Brentwood, Frances Starr was maid of honor, "Capt James Stewart of the Army Air Forces" was their best man. At the time of his marriage, John is called 'vice president of an airline and is field manager at Thunderbird Field, Ariz., an air force training site. The couple will reside in Phoenix. The bride is under film contract to David O Selznick.' Dorothy McGuire is arguably best-known today, at least to Disney lovers as "Mother Robinson" in 1960's "Swiss Family Robinson." Dec 1943, Margaret Sullavan has just opened in "Voice of the Turtle", Brooke states it's the "first play she had agreed to do in seven years" (Haywire, p63) It played at the Morosco Theatre for about four years. She was starring opposite Elliott Nugent. This play was made into a 1947 movie starring Ronald Reagan and Eve Arden. On 13 Jan 1944, New York Times "The Hudson Theatre, 141 West Forty-fourth Street, is on the verge of being acquired by Howard Lindsay and Russel Crouse from the Emigrant Industrial Savings Bank for $300,000... Associated with the Messrs. Lindsay and Crouse in the venture are Elliott Nugent, Leland Hayward and the Cullman Brothers, Howard and Joseph." On 25 May 1944, New York Times "The old Hammerstein Theatre and fourteen-story office building at 1697 Broadway, near Fifty-third Street, passed into new hands yesterday with the completion of a deal whereby Howard S Cullman, Cullman brothers and associates acquired the property from the Manufacturers Trust Company. Associated with Mr Cullman in the purchase were Arthur J Cohen, Mrs David Levy, Mrs Walter Hirsch and Leland Hayward. They are reported to have paid cash above a mortgage of $400,000 for this well-known property." Many years later the Ed Sullivan television show was produced here, and much later "Late Night with David Letterman". Jane Fonda (b 1937) mentions being friends with Brooke Hayward (b 1937), and Peter Fonda (b 1940) and Bill Hayward (b 1941) the son, were also friends, Bridget was the odd-girl out. Jane, Peter and Brooke describe many experiences the children had together in their respective autobiographies. Leland who had some years earlier divorced Margaret Sullavan, married his fourth wife Nancy "Slim" Gross in Jun 1949 "in the garden of the estate of William S Pawley". She was "once called the world's best-dressed woman." She had just recently that same month, divorced from director Howard Hawks and so is most commonly known in print as "Slim Hawks". In this same year Leland produced the hit play "South Pacific" with his co-producers Richard Rodgers, Oscar Hammerstein II and Joshua Logan. Together they won the 1949 Tony Award for Best Producer of a Musical. This play was later made into a 1958 movie. Leland was also the producer of Henry Fonda's Broadway play "Point of No Return". It was in the days leading up to the opening night of this play that Fonda wrote to Leland, "You're the best producer in the theater. You're one of the brightest men I've ever met" ("Fonda: My Life", p222) While Fonda was playing the Broadway hit "The Caine Mutiny Court Martial" in 1954, he got a call from Leland that "Mister Roberts" would be filmed with John Ford as the director and Leland as the producer, and they wanted Fonda for the lead again even though he was by this time fifty years old. This was as well the film debut for Jack Lemmon who played Ensign Pulver in this 1955 film. In 1959 Leland co-produced with David Merrick the Broadway play "Gypsy" later made into a movie starring Natalie Wood. Leland and Nancy divorced sometime before his fifth marriage in 1960 to Pamela Digby, better known as Pamela Harriman U.S. Ambassador to France 1993-1997. She became a Harriman after Leland's death when she married William Averell Harriman, Ambassador, Secretary of Commerce, and Governor of New York State. Pamela Digby also has a royal ascent, being the daughter of Edward Kenelm Digby, 11th Baron Digby of Geashill. Also that year Leland won a Tony Award as Best Producer in a Musical with his co-producer Richard Halliday for "The Sound of Music" which was later in 1965 made into a film. Leland Hayward died 18 Mar 1971 at Yorktown Heights, New York. Leland Hayward Papers, 1920-95 at the New York Public Library, 332 boxes ! However for some utterly bizarre reason, the archival biographer seems to think that Hayward's romantic interests, family life and airline are not worthy of even a note! Heaven save us from biographers.